Shek O is a Great Soaring Site for E winds but can handle NE to SE conditions. Every now and then it produces Thermal conditions. The ridge has North and South facing aspects. In North condition it is best to stay at the North end of the Ridge and when it is South stay at the South end due to turbulence you can get if the wind is not due East. The Normal takeoff is on the North end. It is on a steep slope with a gritty dirt and grass covered surface. Proper setup is needed as the launch is committing. As soon as you inflate the wing will grab and you will be airborne. There is a light wind Take Off at the trig point at the middle of the ridge. It is a little bit further of a walk but is a bit higher and straight after launch you can fly to the reliable lift area. If conditions permit you can fly across the gap to the South to Cape D’Aguilar. If you attempt this then you should be aware that theglide is substantial. Gain as much height as possible and get out in front as far as possible before leaving the ridge. The Gap generates quite a venturi effect. The lift at Cape D’Aguilar is smooth and strong when it is working. Winds to look for on the HKO website are Waglan Island with as much E as possible and 15-20km being ideal. Since September 2018 there is currently a hazard which makes landing at Shek O Rocky Beach even more challenging and only VERY experienced pilots should attempt to land there currently. 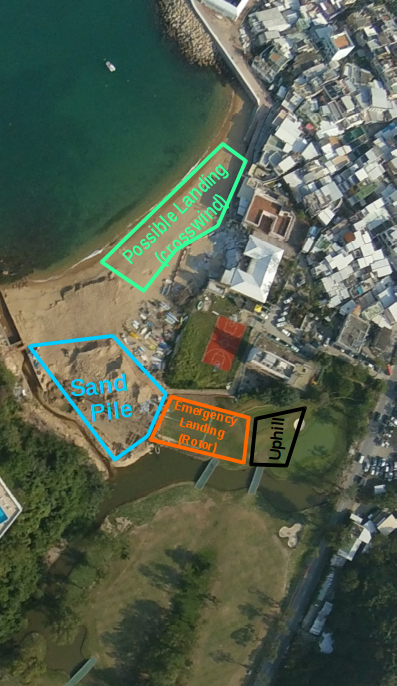 Main hazard is a big pile of sand that is placed on the area where the normal landing site. This sand pile comes together with construction equipment surrounding it. 1. The right hand site of Rocky Beach, this would be a cross wind landing and also watch out on the left side close to the normal landing site there are metal poles in the sand (suppose to have been removed in the meantime). The following Video was taken from the top of the sand pile. The LZ requires inspection before your first landing. Considerations are the deep and polluted waterway to the Left of the LZ, the tall barb wire covered fence on the approach, the wind direction, which can cause turbulence if too North, and the length of the LZ. When there is a reasonable wind, the length does not become a factor. Be extra careful of your line inspection when launching as twigs and leaves causing knots will cause you issues as there is little chance to inspect your wing when inflating. 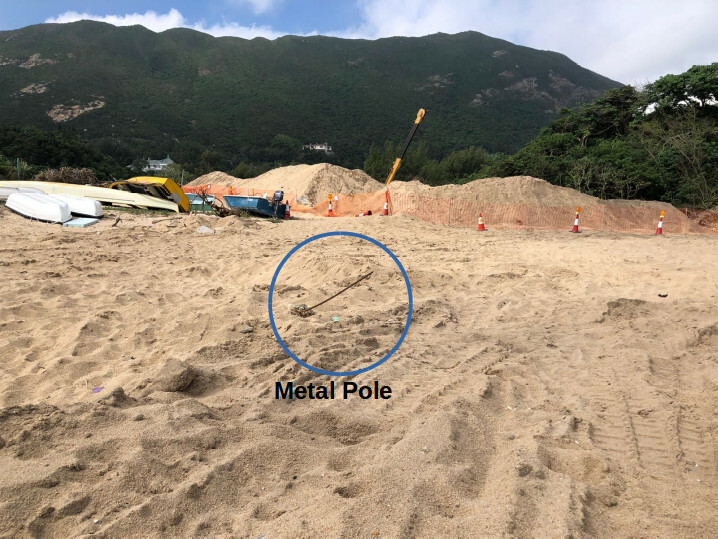 The most important thing to note about the landing at Shek O, is that landings at Shek O Main Beach or the Golf Course are not permitted unless it is a real emergency and no other safe landing options are available. 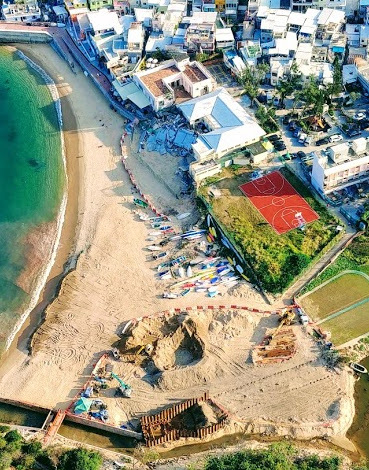 People have been injured by paraglider pilots landing on the Main Beach and further violations of this rule could lead to sanctions against the HKPA. Flights to Cape D’Aguilar are only to be considered when the pilot is sure that enough wind exists to return to the Main Ridge or to at least the normal LZ at Rocky Bay Beach. The LZ is the small area inland of the small beach to the East and North of the Main beach (Rocky Bay Beach). You cannot see the LZ from the Normal Take off, but it is visible from the Trig station. For landing at the LZ setup should be made over the small knoll slightly inland. Consideration should be given to the final glide. Too high and you may overfly the LZ and too low you may not clear the fence and be forced to land short in the Golf Course or in the polluted water. You should plan to cross the Tall Fence ( it has barbed wire on top !! ) at about 10 feet and then use appropriate brake to stop yourself flying past the LZ. The Sandy beach is a small sand dune that rises up from the grassy area, so this should help you make the landing area. This Video can give you an idea about the landing site and a clean approach. If there is an emergency and/ or a landing at Rocky Bay Beach is considered unsafe due to prevailing winds (e.g. shifting to the North) then a landing on the Main Beach or the golf course can be considered as a last resort. You will be met by security. If you politely explain that you landed there for safety reasons, and that you will pack up and vacate ASAP, there is every chance that they will be understanding. However, it must be understood that they are acting under the instructions of their members who are most definitely NOT HAPPY about us landing there. If the golf course is the only option, be sure not to land in the middle of a fairway of green. You will most likely be met with a very angry response from golfers. During daytime, you can exit the course. There are gates on the other side of the golf course (adjacent to the road) that are not locked during the day which can be used as exit points if need be. Even though this is a large landing area, at times it is so full of people that a safe landing clear of beachgoers has proven difficult. 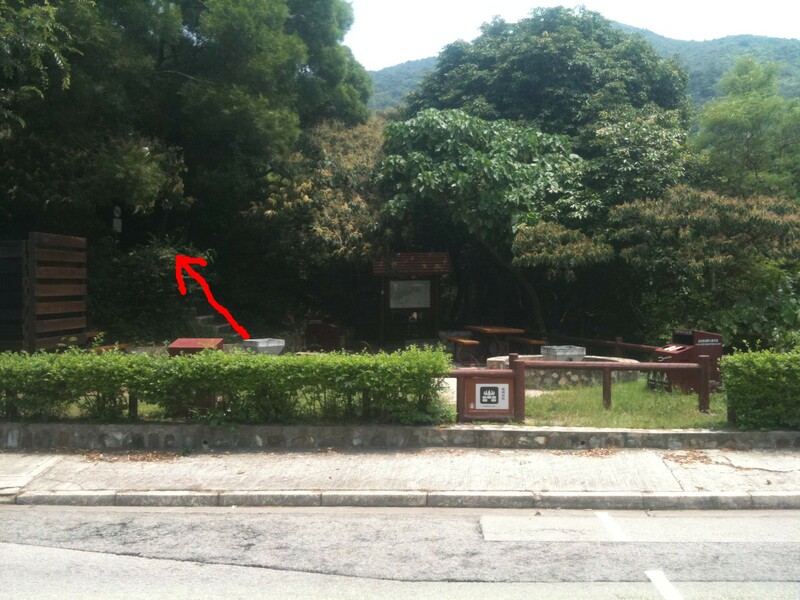 For this reason, Shek O Main Beach is an emergency only LZ. If you land on the Main Beach, expect to be approached by a lifeguard. At least one group of beachgoers have sustained injuries from a pilot who landed there after misjudging his height when returning from Cape D’Auguilar. 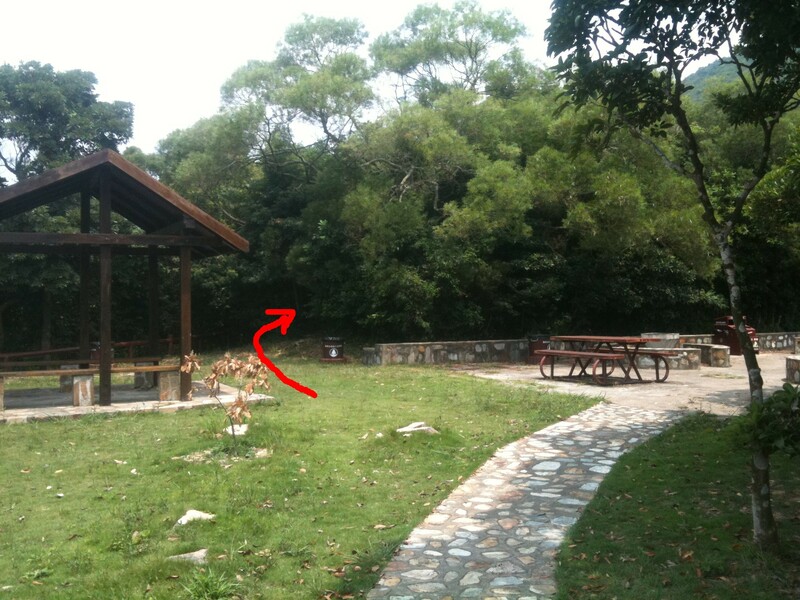 Getting to Shek O ( Taxi )– It is simple to take a taxi toward Shek O. All the drivers know the way. When you get to the Roundabout that is the start of the Shek O Road, you stay on it until you see the only Car Park on the Right. This will be half way along the ridge. (MTR / Bus) – You can catch the MTR to Shau Kei Wan then the 9 Bus to Shek O. Get out at the same Car Park as the taxi. Walk up the Hill ( 20 min Moderate Climb ) - From the Car Park you may be able to see a windsock. Cross the road and walk up the stairs to a small BBQ area. Stay to the Left and go through the small path under the trees that makes its way up the hill. When you get to a crossing track,go Right for about 10m then Left up the hill again to the top. The Normal Takeoff is directly in front of you.